Love Has No Age Limit is Here! 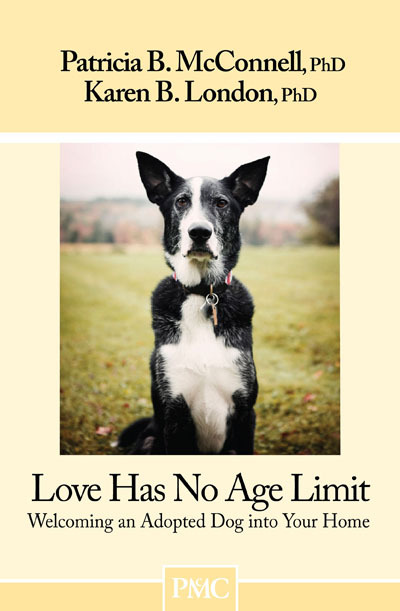 Blog Home >> Animals and the People Who Love Them >> Love Has No Age Limit is Here! If you’ve written a book, you know what it’s like to hold the final version in your hand for the first time. But right after it came, I entered my office to find a closed box of the books sitting on my desk. I took a breath and parted the cardboard panels. It’s scary to look at the book for the first time. Is it okay? Color right? Some horrific mistake that somehow passed through all the proofings? But, ah, when you pick it up and it’s okay and it’s good and you like it and all that work sits lightly in your hand? Priceless! *** Karen and I combined our combined years of experience working with clients who adopted dogs as adolescents or adults, with that of your wisdom, dear readers, and that of colleagues who have spent years helping to place dogs into their forever homes. We have high hopes that the book will not only encourage adoptions, but also increase the number of successful ones. (One research project found that almost a third of all adopted dogs were returned in the area studied.) It’s very clear that there are patterns to the adoption of older dogs, including in some of the problems that arise, and we’ve learned that a little bit of advice can go a long way toward helping families adapt to a new dog with a minimum of problems. Often the problem relates to expectations, and once expectations are aligned, things go much better than before. *** We asked you and Facebook readers to send in a photo of a dog you rescued or adopted for the cover, and received over 800 of them. 800! Seriously! We loved every single one. It wasn’t easy, but we finally chose a dog named Theo to grace the cover, and a more compelling dog couldn’t be found. Theo was picked up by animal control on a New Jersey freeway, languished in a shelter for months, and is now a licensed therapy dog and beloved friend of Kimberly Wang in New York City. *** So many fantastic photos, along with heart-swelling stories, came in that we decided to select more of them to introduce each new chapter. You can read about them and see some of their photos on our website.We’ll get more of them up as soon as we can. *** We set a goal early on of creating a book that was thorough enough to be helpful but concise enough to be accessible. As importantly, we committed to creating a book that would be affordable for shelters and rescue groups so that they could hand it out with every dog they place. I’m thrilled with how it’s worked out: The printer, Suttle-Straus, graphic artist and typesetters, Jam Graphics, all agreed to take a substantial amount of their fee off of the price. We are truly grateful to them and thank them for their generosity. If you feel like it, send them an email and thank them too, we think they stepped up to the plate above and beyond. Because all the actors have been so generous, Love Has No Age Limit, if purchased in quantity, sells for a seriously ridiculous price. It’s barely covering our expenses, but it feels really really good nonetheless. We know how strapped shelters and rescue groups can be, and it feels wonderful to do our part to help dogs, as well as the people who want to adopt them. *** We have a section on the website to help groups brainstorm ways to buy the book in bulk (when it is the least expensive, $2.95/copy) I’d love to hear your ideas about it. I think the best idea is for groups to ask donors to purchase books and donate them to the shelter. We know from research that people are more likely to contribute money for something specific rather than just cash toward a general fund. I noticed that the Editor of Bark Magazine encouraged everyone to foster a dog this summer in their latest issue–a great idea that I’m all in favor of. Yeah for Claudia! However, it’s not something that each of us can do, no matter how much we’d like to. In April I had a foster dog scheduled to come to the farm in a few days (excitement reigned! ), but then Willie’s injury was diagnosed at the Vet School, and we had to back out because I knew having a dog to play with in the house would make his recovery even more difficult. (The little girl found a good foster home soon after.) I’ll start again once Willie is recovered, but it’s not in the cards for us this summer. But it feels good to have spent over 8 months working on this book… we all can only do what we can do. MEANWHILE, back on the farm: Great news! Willie and I just got back from physical therapy and it looks like Willie is doing really, really well. Yes, it’ll still be three more months before he can be off leash again, but his range of motion is good, he is striding well, the swelling is gone and he’s doing well with all his PT exercises. Yeah Willie boy. We are even relieved of the 10 minutes of heat before each session, which will make doing the new, more active exercises easier to do. He also loves doing the active exercises the best, rather than the passive range of motion ones we’ve worked on so hard for the last month (are we surprised?). Here’s some photos of him and Courtney Arnold, Willie’s physical therapist extraordinaire. « Can Animals “Blame” Others? The cover is priceless — you could not have found a more dignified pooch than Theo to grace the front of that book! I’ve taken to a lovely border collie pittie mix named Jazz at our local shelter. She and I got special permission to attend group classes starting this Saturday. If she’s lucky enough to get adopted during the class, I’m going to transfer her membership to the new adopter. And I might just grab a copy of this book to donate to the lucky adopter, too! Thanks for all you do! I hope Willie keeps making great progress! Patricia, you’re a true hero. Thank you for all you do for dogs, and especially for shelter dogs. I meant to enter your photo contest, but the deadline slipped by. I have two rescued dogs adopted from our local shelter. Angus came home with us when he was five weeks old (Before we knew this was too young – I’m sure you can imagine some of the issues that arose). We adopted Simon a year later, when Angus was one and Simon was seven months. Your books have helped me many times over the past seven years. I joined a dog training club and we trained, and trained, and then we trained some more. Both Angus and Simon now have their CGCs, REs and CDs. They can do all the Open exercises, and Simon has shown a few times – no Q’s yet. 🙂 But more important than the titles is the progress they’ve made emotionally. Angus is no longer fearful of men. Simon doesn’t cower and run into the other room whenever there’s a loud noise on television. We have so many little victories to celebrate, thanks to you and other positive trainers. I look forward to reading this new book, which I surely would have loved to have when I first adopted the boys. I know it will be a great help to many new dog Moms and Dads. Thank you for sharing your knowledge with us! My wife and I just rescued a dog 3 weeks ago, and she has been wonderful. I come from a family that has rescued dogs all through my formative years, so it was an easy decision for both of us. I wanted to purchase your book, but I see there is no digital edition available! 🙁 I very rarely buy books physically any more, and it would be great if I could download it to my Kindle on Amazon (ideally), but if not, ePub/Mobi format on some digital book e-tailer would work really well as well. You should really start to look into digital book publishing. It’s a really wide audience, and in fact, can mean more money in pocket for you as an author. Congratulations on the new book, it’s on my list for sure, then I have them all. I know we’re not supposed to, but oh god I want to gather that Willie up and hug him. He’s so sweet and needy looking. His hair’s growing back quickly. YEAH – both the book and Willy look GREAT. I can hardly wait try to drum up some business to order some for our sanctuaries! Congratulations :). I’m going to buy a copy and spread the word here in Australia. I’ll either buy it through Amazon, or I’ll check with a friend in NY whether I can ship it to her and then she’ll bring it to me on her next trip to Australia (coming soon), or maybe she can mail it on to me. It looks great. Thanks for writing it. Theo is just perfect for the cover! What a darling boy. It’s so heart-swellingly wonderful to hear how you and all those others involved in bringing this book into being have done so much to make this book accessible to as many folks as possible. Well done all ’round!! I look forward to buying copies myself (but as you don’t ship to Australia I’ll source it elsewhere online). As far as each doing our bit… I’m not in a position to foster myself at the moment (I already have nine creatures in my Clan) but I am doing some fundraising for petrescue.com.au – my re-home/rescue whippet and I are entering the 20km Endurance Test to be run here in NSW on August 7 and I am using that event as an opportunity to fundraise. Petrescue will soon have a little story about us up on their website (I’m still waiting to hear back from the person getting the page sorted out) and a facility for donating. All the very best to you and Willie, and THANK-YOU for “Love Has No Age Limit”. To Mark: All my self published books are available on Kindle, and will be soon on Nook and other eBook readers. Love Has No Age Limit will be out as an eBook soon. Thanks for asking! To parlance: Thanks for the word from Australia, love your idea of having a friend order in NY and shipping. Our website doesn’t let us ship overseas (sigh), but you can also order through Dogwise or Amazon. I’m not sure the book is on Amazon yet, but will be any day. Your new book was not on my radar, so I didn’t know about it until I just saw the post on FB. My daughter posted that, and I look forward to purchasing the book. My husband and I have had just four dogs in our 46 years of marriage, as they all have lived long lives, all from a shelter, first was a walk on that no one claimed, so we kept her. Our current dog is Dixie, a shepherd mix. She was in a Waterville, Me. shelter for over 7 months, originally came from Georgia, no idea how or why. Her age was put at between 8 to 10. She had no upper or lower front teeth, worn to the nub. She has some molars. Her euthanasia was looming at the shelter, so a rescue shelter here in Maine took her in and fostered her. She was in the foster home for 3 months when I saw her face on Petfinders.com. We had lost of dog of 15 years, Brittany, five months earlier. Dixie was not the dog I was looking for; I was looking for a Brittany, but for some reason Dixie tugged at me. We adopted her from the rescue shelter over four years ago. She came with many issues, but we read and adopted some simple methods to make her feel more comfortable and to give her confidence. She is quite a girl; didn’t really see her true personality for nearly a year. She is now quite deaf, but sees well, eats well, has some arthritis in her spine, is not on medication unless needed, loves her toys, loves her sardines on her kibbles, plays like a puppy sometimes. It a nutshell, she is a great dog for us. Our local vet estimates her to be about 14. We will be sad when she goes, but so glad we took her in. She has been a joy. So many older dogs are passed by for the puppy or younger dog, and I understand that, but the senior dog has a lot to offer. We would do it again. Just a th0ught of how to get books donated to the shelters: My local library has an Amazon Wish List of the books it desires. Donors just go on Amazon, pick the books they wish to donate from the list, pay for them, and the books are shipped directly to the library’s intake address. If the shelters got on board the same way (Amazon Wish List), it would facilitate getting these books out to them. Thanks for reminding us there are ways to help even if fostering is not a possibility. 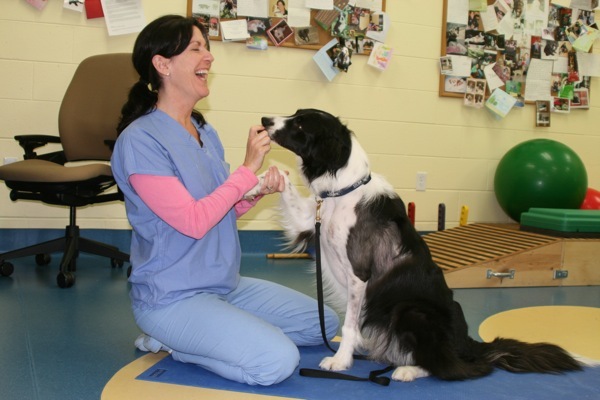 What wonderful photos of Willie in physical therapy! It looks like fun and not just work. Great work; the book and Willie. FWIW: I adopted my Sheltie from WI Sheltie Rescue when he was between 1 and 2 years old. His exact age is approximate. We hit it out of the park when he came home to live with us. I couldn’t ask for a more obedient, intelligent and trustworthy dog. He is CGC and TDI. My Dobie is 15 months old and also came from WI Sheltie Rescue. Its a long weird story. He has a lack of self confidence but we’re working on that and making progress. I start CGC training with him later this month. This guy is smart as a whip! I’m looking forward to a great time as we train each other. I’ve thought many times of fostering a dog but no longer. Two dogs in the house is enough for me. I can still donate and contribute to the good of the cause in other ways as you suggest. Yippee! The book looks great, and so does Willie! I don’t foster very often, but I actually have a foster dog right now. She’s a gentle, old girl that is an easy keeper. I don’t think she’ll be here long. I can’t wait to get a copy of the book! Yippee! I think it’s a wonderful idea to try to get the books in shelters. Of course there’s always the question of what is most pressing; our local shelter is so under-funded they are in immediate danger of closing. I’d like to donate books, but the other side of that is that they really need operating expenses more than anything. I also think the book itself is a fabulous idea. As to the Bark encouraging people to foster— I have two dogs and a cat and a full-time job outside the house; it’s just really not feasible. I actually cancelled my subscription to that magazine, because the subtle and not-always-so-subtle adoption push made me feel perpetually guilty for my decision to buy a puppy rather than adopt. Is it just me, or has the “choose a rescue dog” movement gotten so strong that those of us who own and like pure-breds, and prefer a puppy to a rescue, sometimes feel like we are looked down upon by a large segment of the dog community? Between that, and the fact that I consider myself a “dog owner” and not a “pet parent”, it seems there is a growing rift that makes me uncomfortable. As if it’s no longer quite enough to do good by your own dogs. Sorry, this comment might be out of place in this particular blog post. It’s more in response to your mention of the Bark and not at all a reflection on your much-needed guide to brining an adult dog into your home. Keep up the great work. At my house we end up with a succession of very short term fosters (overnight) since strays are always following Ranger home. There’s nothing quite as much fun as suddenly assuming custody (albeit very temporary custody) of an adult about which nothing at all is known. At least when you foster from a shelter or rescue you know a vet has looked at the dog. I know exactly two things 1) the dog was on his own and 2) the dog likes Ranger; everything else I get to figure out for myself. Last night about 9:00 p.m. we gained an Aussie or maybe an Aussie mix as the head looks more cattle dog to me. Surprisingly calm for an Aussie with nice polite manners (immediately sat when the treats appeared) well fed (overweight actually) and somewhat neglected (lots of mats in the coat). About 3:00 a.m. I learned about the separation issues (howling and barking) and the possessiveness (Aussie did not want to share the resource of a person and kept blocking Ranger’s access.) Thanks to this blog, your books and John Bradshaw’s book Dog Sense I was able to cope with this stranger and the issues presented. Ranger apparently does not consider me a scarce resource and four hour stretches are apparently manageable by the Aussie so spending an hour with them in Ranger’s enclosure was enough that I got to go back to bed for awhile. Now I’m off to walk the dogs (slip lead for the Aussie since he, of course, has no collar or tags), take Ranger to work (he’s visiting a nursing home this morning), come back and collect Aussie to turn in to the local shelter. I wish I could foster longer term but in our crazy life it isn’t practical right now. To Beth, before I go do Willie’s exercises: I’m glad you like the idea of the book and I hear you regarding your perception about the angst (or potential of) of buying a dog versus adopting one. I’ve written a lot about this issue in other blogs, just suffice it to say here that surely there are ways to both encourage adoptions and also allow people to buy puppies without guilt. I think there are, I think it’s a n0-brainer as a matter of fact, and I wrote a column in Bark and a blog about it. I was roundly criticized by some last year for buying a puppy, and yet I’ve rescued and adopted a number of dogs who were desperately in need of homes. I’ve also purchased pure-bred dogs as puppies or older dogs, and I’m going to continue to do both in the years to come. I’ll keep doing all I can to help dogs and the people who love them, and I’ll continue to attempt to create the life I want in my own home. That’s just my story …. the point is that no one should feel guilty for providing a wonderful home for a dog. And, good point about a local shelter being so strapped for resources that the books would be a luxury. Every shelter, and every dog owner, is an individual with their own story, right? Good to remember. Thank you, Trisha, for your kind response. The part about what our particular shelter needs was sort of stream-of-conciousness on my part. I wholeheartedly agree with the fact that a book like this can help stop the repeat surrenders that some dogs endure, and thus in the long run can greatly improve dogs’ chances of finding forever homes while also reducing a shelter’s operating costs. Alas, our regional shelter doubles as a true shelter and a pound; the local communities don’t have their own pounds for strays (lost pets) and so the shelter is stuck with a lot of overhead for dogs that are not adopted, but instead reunited with owners. The communities have not paid enough to cover costs, so there is a structural operating deficit. My comment arose from my thinking “Perhaps I can donate a crate of books to them!” which was immediately followed by the thought “Hmm, but I wonder if they could use food more.” Perhaps I’ll ask them what they would like more. The sad fact is, what they need most is to be relieved of the burden of so many hundreds of semi-feral kittens and cats; their dog situation seems to be under control. And lest it sound like I let strangers abuse my dogs, I have related the handful of worst-case stories out of thousands of encounters with friendly people over several years. With toddlers we are right in the mix so we can instantly intervene on any inappropriate behavior on the kids’ part. The elderly woman was lovely with the dogs— until the instant she wasn’t. It took me several dumbfounded seconds to get my dog away from her and I was so grateful for Jack’s wonderful tolerance at that point. And as for the developmentally challenged adults— two bad experiences have made me realize that, sadly, it’s just not safe to put my dogs in that position unless there is a trained worker near at hand; one is helpless to intervene if a 200-pound man starts hauling your dog away by its head as the dog looks to you with pleading and shocked eyes— Lennie from Of Mice and Men comes alarmingly to mind. I absolutely agree that no one should be making you feel bad about choosing a puppy from a breeder. I think people absolutely have the right to make their own choices about what’s right for them, and no one should make a responsible dog owner feel guilty for not owning the ‘right’ kind of dog. I also really appreciate your point about the right dog for the right situation. It’s not enough to have a good dog and a good home, they do have to be a good match, and it sounds like your dogs are a great fit. That said, though, I do feel I have to object a bit to the implication that shelter/rescue dogs are always somehow damaged, or least less trustworthy than breeder pups. There are lots of dogs-in-progress at shelters, and if you’re willing and able to provide some rehab, you’re certainly spoiled for choice, but there are also lots of dogs in rescue who DON’T have major issues. My recent adoptee, Sandy the Mutt, is as close to bombproof as any dog I’ve ever encountered. Kids, dogs, cats, weirdos, she is trustworthy in virtually any situation. She needed a minimal amount of work on her self-confidence and excitement levels, but she came to me as good a dog as anyone could want. I knew this already, because she originally belonged to a family member (shelter stray before that), but the fact is that many dogs are surrendered to shelters and rescues for reasons that have nothing whatsoever to do with the dog. Like thousands of others, Sandy would have ended up at a shelter because her owner was moving. Other dogs are surrendered for everything from getting too big, needing too much exercise, being too hairy/drooly/prone to scratching the hardwood, or costing too much to care for. One could argue that a shelter/rescue dog is a gamble, because you may not know what problems the dog has until you get him home, but any dog, even a good pup from a good breeder, is a crap shoot. One of the great things about fostering is that it helps identify the strengths and weaknesses of a dog before matching him/her with a prospective family. It’s wonderful if you can do it, but it isn’t necessarily easy, and it’s not feasible for everyone. So I’m absolutely on your side…there is no excuse for being rude, and nothing wrong with wanting to raise a puppy, but I did want to nitpick your reasoning just a bit. I think that the breed rescue/fostering movement can really help people who’d like to adopt but need or want a specific set of qualities in their dogs, but I’d hate to hear that organizations were making adoption more appealing by denegrating other options. LOL, Reading through the new posts I was mentally composing my response to Beth when I read a little further and discovered Em had already posted my response. I figure everyone gets to pick what they want, whether a pure bred or a breed rescue or a shelter mutt but I do get tired of the assumption that because a dog is at a shelter it has issues. My dog Ranger wound up in the shelter because his owner died. I couldn’t have found a better socialized dog. He didn’t have much in the way of manners but it didn’t take long to realize he’d been socialized to everything a dog is likely to see as a pet. He would have had no problems adapting to life at Beth’s house–after all he manages to live happily at mine [wry grin for our chaos]. The goal, as far as I’m concerned is to find a dog that fits your life and to do your very best by that dog whether a puppy from a breeder, an adult from a shelter, a damaged dog from a fighting kennel or whatever dog you pick. Sounds to me like Beth did a great job of figuring out what kind of dog she needed and finding the right dogs to fill the bill. It also sounds like her dogs are very lucky and have a great life. You can’t ask for more than that. em: Thanks for your thoughtful addition. I agree completely that many, many dogs who need homes are great dogs who’ll end up darned near bomb proof. I’ve met a bunch of them. And I also agree (and written many a time) that all you can ever do is increase the probability statement that a particular dog will be right for you no matter where it comes from, by temp testing, evaluating, selecting the right breeder and parents if that’s your preference, etc. And still it might not work out. But I do sympathize with the desire to get a puppy with just the right breeding and then raise it in the environment you want it to be comfortable in. That’s why I think there is room for everyone at the table, as long as we are all responsible. Just more reasons to advocate that everyone works together to increase the welfare of dogs all around the world. Congrats on the new book! I look forward to reading it – I have all of your others already. My most recently added dog was obtained as a puppy through a breeder. He’s now two years old. All of my previous dogs have been adolescent or adult dogs adopted through breed rescues. I have also done lots of volunteer work with shelters and breed rescues. I struggled with getting a puppy from a breeder because I am a big proponent of adopting non-puppies in need of homes. But I wanted to go through the experience at least once of raising a puppy. I think there is a common misconception that if you adopt an adult dog, you’ll have major behavior issues to address. Sometimes there are and sometimes there aren’t. With a puppy, many people assume everything will be perfect because you’re starting from “scratch”. But you can do all the research, find a great breeder and do your best raising a puppy and still run into issues. There is no such thing as “starting from scratch” – you’re always starting with genetics. There just are no guarantees! I was thinking about how common it is to find a bombproof dog or puppy in a shelter this morning, and it occurred to me that while I don’t imagine these dogs represent the majority, in my adult life, I’m two for two. (Even when Otis was still a wild child, he was always really tolerant of all manner of nonsense). So while they may not be the majority, shelter dogs with great temperaments can’t exactly be one in a million. Perhaps people are getting the wrong overall impression about rescue dogs because the ‘heartwarming’ stories about long struggles and dramatic turnarounds get told over and over and over. I know that there are lots and lots of dogs in rescue who need short-term intensive help to get where they need to be, (Otis was one, though still arguably easier than raising a puppy) and still others who are going to need serious retraining over long periods, but thinking back on my family’s experiences with adopted dogs (my extended family has always owned a mix of dogs of various origins-adult adoptions, puppies- both mixed breeds and purebreds, from breeders and shelters and neighbors), I realized that as a family, we’re 14 for 14 over the last thirty-odd years. Wow. I can’t remember a single dog that I couldn’t play with or take for a walk, even as a child, or one who ever bit anyone, hurt another dog, or caused any serious trouble. I also realized that no one ever made a big deal out of any particular dog’s origins. No one ever told the ‘rescue’ story of these dogs because the story always went like this….We wanted a dog, so we went to the shelter, picked out a mixed breed puppy or an adult who had no real problems, and lived for many happy years together. Or…we wanted a specific type of dog for some reason ( german shorthaired pointers, dobermans), found a breeder, raised a puppy with no serious problems and had many happy years together. Or…our neighbor’s dog (german shepherd) liked jumping the fence to come play with the kids so much that our neighbor eventually just brought over his papers and gave him to us. He had no serious problems and we lived for many happy years together. No, wait, now that I think of it, the shepherd did bite someone…a man was following my 12-year-old aunt, down the street, catcalling and scaring her. Fritz ran up the block (once a fence jumper…. ), barking his head off, and snapped at his leg. Ripped a hole in his pants but didn’t break the skin. Happy endings are nice, but happy middles don’t necessarily make for dramatic storytelling. In my family, adopting was treated as a sensible and inexpensive way to obtain a companion dog, not a philanthropic act, and buying from a breeder was treated as a sensible way to get a particular type of dog, not a betrayal of the shelter system, and I guess I still largely see it that way. Maybe the word ‘rescue’ is too loaded. I confess that I’ve always felt a little uncomfortable with it, because it makes it sound like I deserve a medal or something, when in fact, I made a choice that made ME happy and required precious little special sacrifice on my part. *Don’t get me wrong, these were normal dogs…pot roasts got stolen off of countertops, rugs got ruined and furniture got chewed, half of them were afraid of thunder, one uncle had his pair of dobermans bust open the tap on the kegerator (I had some fun cousins), and another had a rottie/golden mix swallow a flashlight. The whole thing, D batteries and all. But no aggression, no SA, no shyness. It seems like that can’t be typical, but maybe it is more common than the stories lead us to believe? em, my apologies for making it sound like I think all dogs from shelters have major problems. They don’t. I know lots of shelter dogs. Many are quite good, and yes I’ve known just as many with very serious issues. Extreme separation anxiety is a common one, along with a tendency to be an escape artist and housebreaking difficulties. It is true that the worst case stories tend to be told the most often, yes. I think I was getting more toward’s Trisha’s point of starting with a puppy “and then raise it in the environment you want it to be comfortable in.” Some dogs shift gears easily, many others don’t. So, for instance, moving from the country to a big city is traumatic for a lot of dogs. Going from a home with one elderly caretaker with regular hours to a family with three active kids would be a lot for many dogs. His genetic tendency to notice differences has been strongly influenced by the predictable home environment in which he was raised. I have a strong suspicion that, as a result, if he were every rehomed into a chaotic home environment, the new owners would complain that my bomb-proof dog was nervous and skittish inside. I could be wrong, but my feeling is he would not be happy with inside chaos. But had he been raised in a more chaotic environment, breaks in routine and doors randomly left open or lights randomly left on would be “normal” to him, and not a matter of concern. So Jack has no “major issues”. But he does have an innate disposition that was influenced by his upbringing that would probably make him a poor match for a chaotic home. Outside chaos, on the other hand, is right up his alley because he’s used to it. He actually seeks out crowds of people and dogs and is reluctant to leave them. When you get a puppy, you don’t start with a blank slate BUT the slate has a lot less on it, and you have much more influence over what you end up getting in the adult dog. With an adult, the early experiences already happened and were beyond your control, and the dog is more of a finished product. Now, the fact is that for an awful lot of people, they are probably better off starting with an adult who’s already had some socialization because I have found that a lot of people seriously underestimate how much they should be doing to socialize a puppy properly. My general feeling is that for people who have a fairly routine home that is likely to be something the dog was already exposed to, a shelter dog is just as likely to turn out great as a nice puppy. I think for people who want a dog to be not just ok with, but actively embrace, lifestyles that are out of the realm of what a lot of dogs handle well, a pup is a better bet. It’s not for nothing that trainers and breeders emphasize how important that early socialization window is. And it’s not for nothing that service dog groups generally start with puppies and expose them at a young age to whatever equipment and unusual situations they will later work with. I’ve added “Love Has No Age Limit” to my Amazon wishlist, so I can go back and check to see if a Kindle Edition becomes available and I can pick it up at that time. We did a poll on a UK dog rescue site. Of 726 respondents, 27% said their rescue dogs settled in with no problems, and 27% with only mild teething troubles. Another 23% got through it with only minor advice or normal training classes. 23% that had major problems. About half of those had significant progress with the help of a behaviourist. Overall, 7% had serious problems which have never really resolved, or who returned the dogs. I’ve just ordered Love had No Age Limit from Amazon.com (It’s not on amazon.co.uk yet, unfortunately.) along with your book on multiple dog households, as I’ve just applied to rehome a second rescue dog. I just hope the book arrives before the dog! I’m a very active dog rescuer in the South and I think this book is going to be invaluable. One of the rescues that I work with and train dogs for is local and it is a very rare thing for us to get puppies. Most of our dogs are a year old at the youngest, not really what most people consider puppies. Almost all of the dogs are wonderful dogs that just needed to learn some manners but sometimes we get those “damaged” dogs that everybody talks about. In fact, one dog who was so feral that he had to be drugged to get him into the foster person’s home just completed our prison training program, A New Leash On Life, and went to his adoptive home! He’s 5 years old and going strong. My own foster, for another group, is a 9 year old GSP with congestive <3 failure. (I call her my forever foster). She was a kennel dog and required intense rehab before she could be considered safe with my pack. The rescue group wanted to put her down but I told them "You sent her to me w/o telling me what you were sending and now I am going to rehab her!" I explained that kennel dogs need 6 mo to 1 year of rehab and here we are, ready for my senior lady to find a home of her own. She has come leaps and bounds. But my point is that in rescue, most dogs are not puppies. Whether pulled from animal control, rehomed from a bad situation, petted out from breeders or wandering alone in the woods or in the middle of a highway… most dogs are adolescent to adult. Based solely on their looks they are expected to be Adults. I'm very clear with adopters that there might be accidents in the house at first or goodies stolen from the garbage. They need to work with their dogs and build a relationship. I try to use humans as comparisons and I tell my adopters and training clients "Just like you and your husband/wife had to build a bond, learn to trust and create a relationship… so too you will need to do this with your new dog". Dogs and people, we aren't so different. Trisha, how like you to choose a black and white dog for your cover model! 🙂 If only he lived in the Madison area, he could become part of your domino group (or is that reference hopelessly outdated? Now I’m having trouble remembering where it was that I read it…). Actually, I remember being surprised that Sushi wasn’t a tuxedo-type, when I first saw her (his?) picture, although now I seem to recall that you described choosing Sushi from an allergies perspective, which I completely understand (being feline allergic myself). At any rate, Theo is extremely handsome and the new book looks excellent. Can’t wait to get my paws on it! This is is the best little book I’ve read for introducing a new dog into a home. The book is short, easy to read and packed with a lot of excellent tips and common sense reminders for acclimating a new dog into its new home. I highly recommend it to foster volunteers and anyone bringing a new dog into their homes. If people followed even half of the suggestions in this book the number of successful adoptions would increase! Carol, you are SO kind to take the time to say so. Thanks! I find it sad saying not everyone can foster dogs – everyone can! However, it’s a choice of whether they truly want to or not. I had a dog who had back surgery last year and it required us to do physical therapy at home 4 times a day. We fostered a dog during that time and it worked out great. We kept hte two separated in different parts of our house. Things like babygates and x-pens provide great ways to keep dogs separated. 4-8 million animals are euthanized in our shelters each year. If you really wanted to help the situation, there would be no excuses. I encourage everyone to definitely look into fostering if the are able. With many rescues and shelters, you can request a certain type of temperment that would be best. If dogs have medical issues in the home, you can easily ask to foster older dogs who have little energy and a quiet demeanor to them. I fostered puppies the other week and that was TOUGH! It reminds me of why I will never purchase a puppy from a breeder. Too much work and I need sleep! haha. Sue from Love my Dog Training. I just wanted to let you know that you still CAN raise a puppy by adopting through a rescue. Check out http://www.petfinder.com and you can find a ton of puppies up for adoption. I volunteer for a rescue organization. We are always getting litters of puppies in. From puppy mill raids, from litters left in boxes at the shelters front door, from backyard breeders who can’t sell dogs, etc. Anyways, you said the reason you purchased from a breeder is because you wanted to raise a puppy. I just thought I’d chime in and say that you can raise a puppy as well by adopting from a rescue or shelter. Petfinder and Adoptapet are two great sites. Sorry – my last comment to Sue on fostering was actually supposed to go on a genetics/inbreeding post from a few months ago.